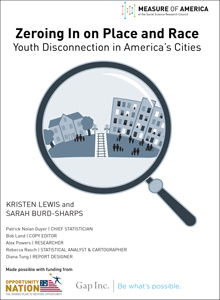 Zeroing In on Place and Race is an in-depth look at how disconnected youth are faring in America’s cities, with data included on disconnected youth by state, congressional district, county, gender, and by race and ethnicity. Disconnected youth are teenagers and young adults between the ages of 16 and 24 who are neither working nor in school. There are 5,527,000 disconnected youth in America today, or one in seven young adults (13.8 percent)—about as many people as live in Minnesota. The national disconnected youth population is larger than the populations of thirty US states. 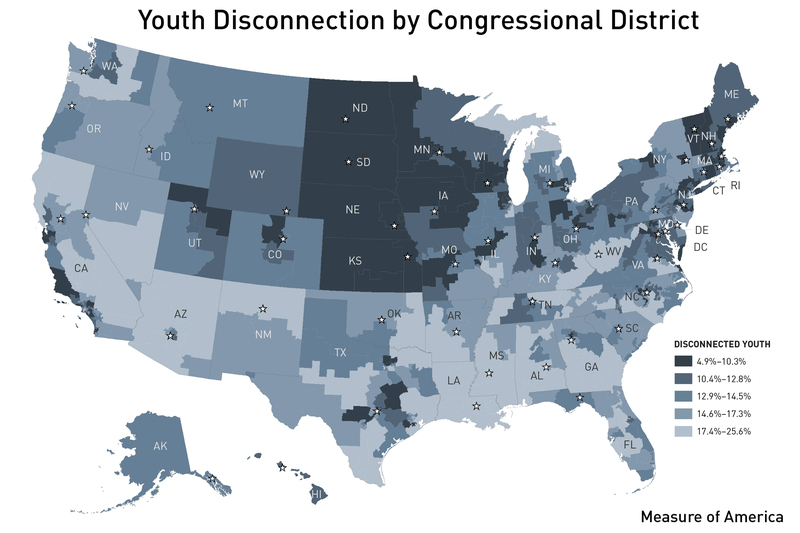 The rate of youth disconnection has fallen since the Great Recession. 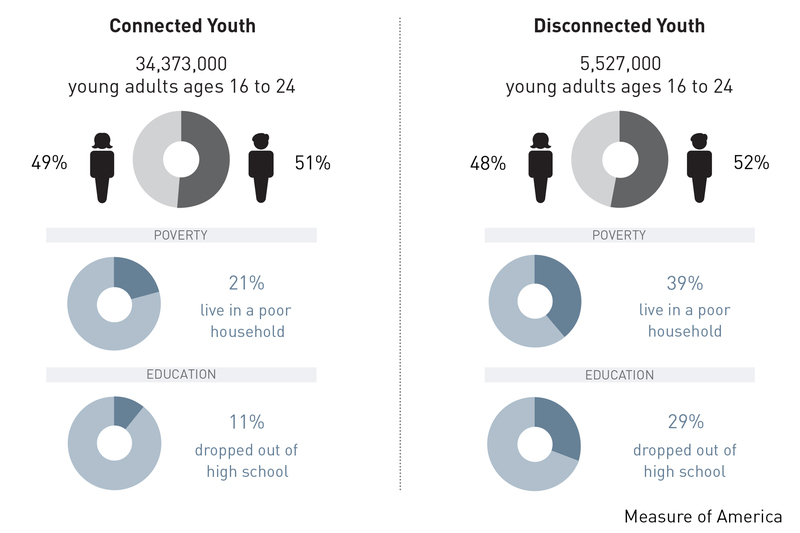 Roughly 280,000 fewer young people are disconnected today than in 2010, the peak year for youth disconnection during the last decade. Beneath the national rate of 13.8 percent, however, lies staggering variation. 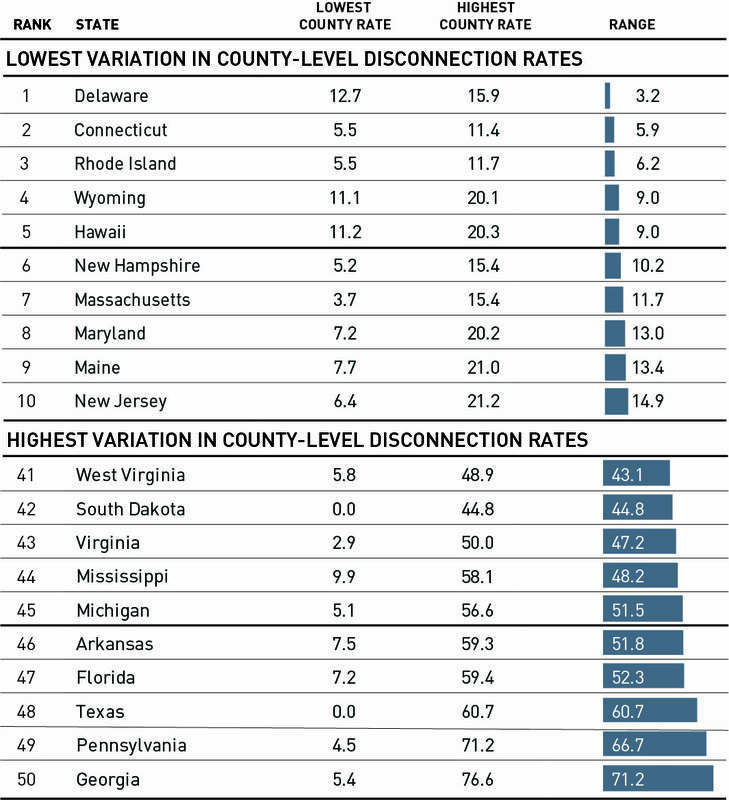 Of the ninety-eight major metro areas included in this report—home to two in three Americans— disconnection rates range from under 8 percent in the Omaha, Nebraska, and Bridgeport, Connecticut, metro areas to over 20 percent in greater Lakeland, Florida; Bakersfield, California; and Memphis, Tennessee. 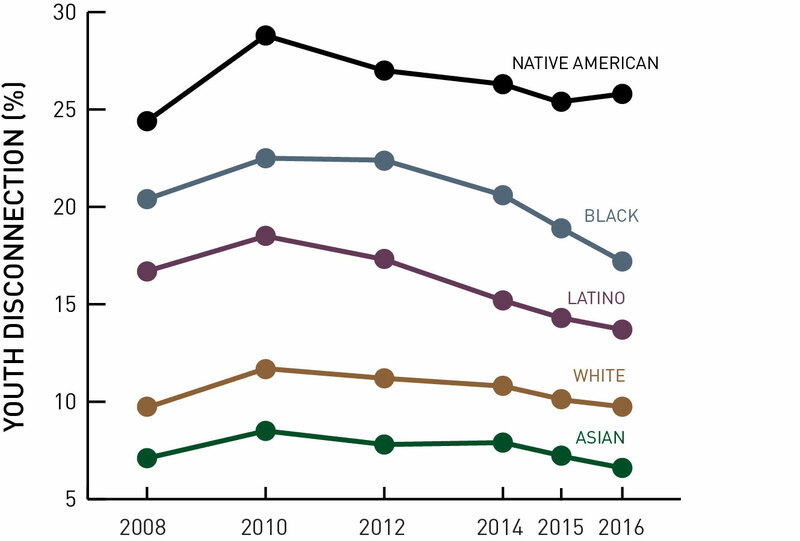 At the national level, youth disconnection rates for blacks (21.6 percent), Native Americans (27.8 percent), and Latinos (16.3 percent) are markedly higher than rates for Asian Americans (7.9 percent) or whites (11.3 percent). In nine metro areas, at least one in four black youth are disconnected. In ten metro areas, at least one in five Latino youth are disconnected. The negative effects of youth disconnection ricochet across the economy, the social sector, the criminal justice system, and the political landscape, affecting all of us. Our analysis of a very small subset of the direct costs of youth disconnection reveals an astonishingly high cost to taxpayers: $26.8 billion in 2013 alone, or nearly the entire amount the federal government spends on science. 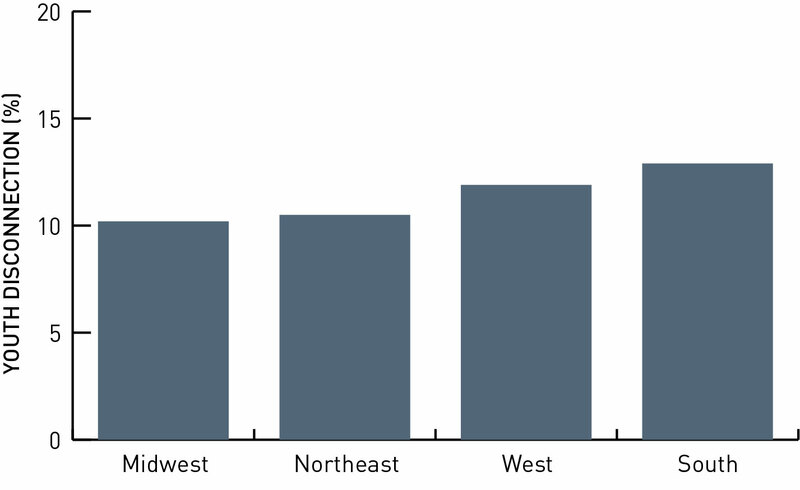 Although national patterns are generally mirrored in metro areas, important variation exists. For instance, a city can simultaneously be among the best for one racial or ethnic group and among the worst for another. 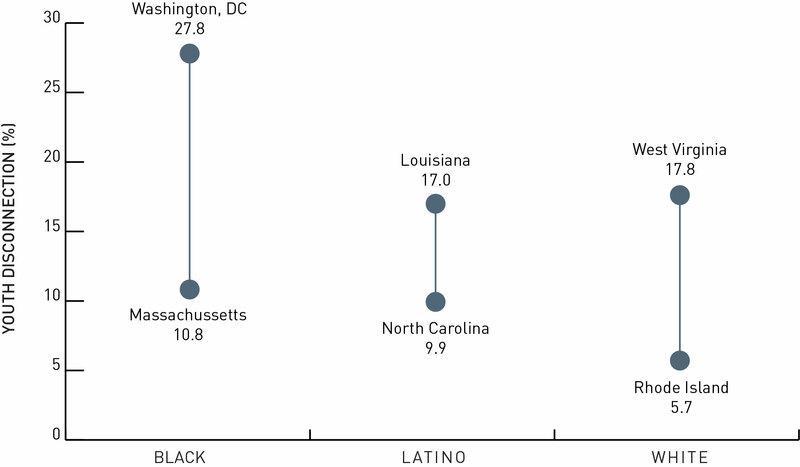 The greater Boston metro area, which has a low overall disconnection rate (8.2 percent), is relatively good for white (6.8 percent) and black youth (9.8 percent), but not for Latinos (17.3 percent). In the Chicago metro area, both whites and Latinos are doing better than they are in the country as a whole (7.5 and 13.9 percent, respectively), but blacks are doing much worse (24.5 percent). New research for this report shows that racial segregation has dramatic but very different consequences for young people depending on their race. 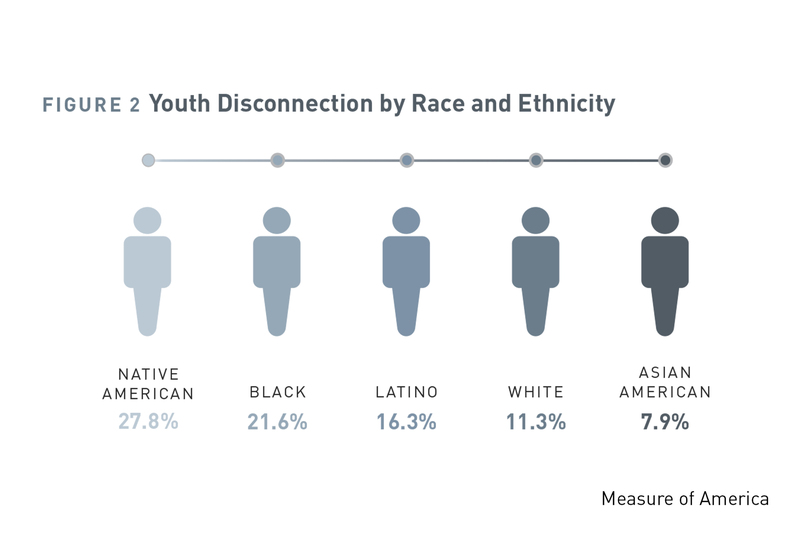 Our research shows that in highly segregated metro areas, black youth tend to have higher-than-average rates of disconnection, whereas white youth tend to have lower-than average rates of disconnection. In other words, residential segregation by race disproportionately harms black teenagers and young adults. Measure of America gratefully acknowledges the financial support of Opportunity Nation and Gap Inc. for this research. Measure of America will help you tell the story of how people are doing in your community. If you are interested in more information, go here.